Suzanne completed her Bachelors and Masters in Burgundy, France, majoring in Plant Physiology and working on grape vines in particular. 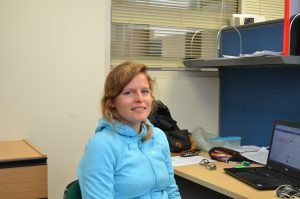 In 2017, she moved from Burgundy to Adelaide to start her PhD at The University of Adelaide. Her research focuses on plant volatiles – a new area in plant physiology. Plants emit volatiles for communication, and Suzanne looks at how these effect drought stress in grape vine and Arabidopsis. The most interesting part of her research is that plant volatiles provide a new and interesting way to look at plants, and that they actually ‘talk’ to each other through the release of chemicals.